This regimen is generally quite safe and well tolerated with many potential health benefits. However, some physicians and cluster headache patients may be concerned about the apparent “high” dose of vitamin D3. There are several studies that have clinically proven that the skin of a fair skinned adult clad in a bathing suit without sun block and exposed to the sun’s UVB at midday, can generate 10,000 – 15,000 I.U. vitamin D3 (cholecalciferol) in as little as 15 minutes. Reactions to vitamin D3 are very rare as skin exposed to the UVB in direct sunlight produces vitamin D3 naturally. It is generally considered to be one of the safest vitamin supplements you can take. However, if you are allergic to sunlight, do not start this regimen without contacting your PCP or neurologist first. If you experience a reaction to this regimen including and not limited to, an upset stomach for more than a day, swelling in and around the mouth or face, or an obvious allergic reaction, discontinue the entire regimen and contact your family physician. The best course of action if this occurs is to start taking the vitamin D3 and if there’s no reaction, add each of the other supplements one at a time, every 3 to 4 days to use the process of elimination to determine what is actually causing the reaction. Several studies have shown that the healthy adult processes 25(OH)D at a rate equivalent to an intake of 3,000 to 5,000 I.U. vitamin D3 a day. As the rate at which the body metabolizes vitamin D3 from all sources into 25(OH)D can and will vary, it is entirely possible that 25(OH)D is consumed as fast or faster than it’s being metabolized from vitamin D3. Under these conditions, the body may be unable to build enough 25(OH)D reserves to reach a therapeutic level sufficient to prevent cluster headache attacks at a vitamin D3 dose of 10,000 IU/day. 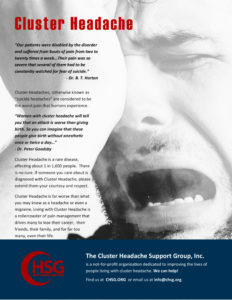 Some comorbid conditions may interfere with the capacity of the anti-inflammatory regimen to prevent cluster headache attacks. Some of these medical conditions include, but are not limited to: cardiac, thyroid, parathyroid, renal, hepatic, and pancreatic insufficiencies. Sub-clinical allergic reactions and sinusitis are also suspect. If you have one or more of these conditions, work with your PCP to make sure they are being treated. This may help make the anti-inflammatory regimen more effective as a cluster headache preventative.